This absolutely flew off the needles and I needed it to as autumn is coming to London! 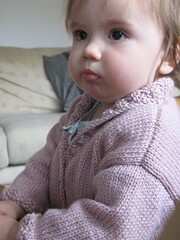 The Cashmerino Aran really suited the rosewood needles and was a sheer delight to work with. I modified the rib because I wanted something a bit more interesting. This is a K2, P2 offset rib – really simple and effective. I also added an extra inch to the sleeve length and proabably should’ve added two because it’s the right length for her now at 15 months. The intention was for her to grow into it! She seems to be having a bit of a growth spurt, particularly in height, so I guess arms grow too, right?! 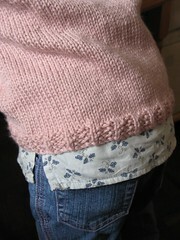 The shawl collar was really easy, some ribbed short rows and it was done. It could even take having another 4-5 rows as it doesn’t seem to sit completely in half at the back but I could tack it down if I really wanted it to look perfect. 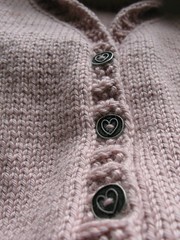 Four metal buttons from John Lewis sewn on and she’s wearing it to playgroup today!